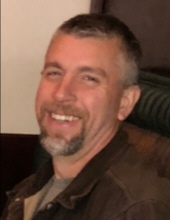 Celebrating the life of John Gary Osborne, Jr.
Obituary for John Gary Osborne, Jr.
John Gary Osborne Jr., 52 Of Kenai died in his home February 4, 2019. He was born in Westminster, California On November 9, 1966. Service will be held Saturday 12:00-2:00 pm at Trinity Christian Center, all are welcome. Burial to follow for family at Spruce Grove Memorial Park. He was preceded in death by his mother, Paula Osborne. He is survived by his father John Gary "Ozzie" Osborne Sr. and his sisters Jenny Miller, Julie Hubbard, Joyce Rawson, Jamie Gabriel and his brother Jason Osborne. Also, all of his children Manessah, Rebecca, Nathaniel, Elo, and Joshua Paul and his mother Jenna Rogers. He is also survived by many grandchildren. He moved to Alaska with his family in 1968 and graduated from KCHS in 1986. He loved hunting, camping, canoeing, fishing, anything outdoors. He loved the Lord with all his heart. "Email Address" would like to share the life celebration of John Gary Osborne, Jr.. Click on the "link" to go to share a favorite memory or leave a condolence message for the family.